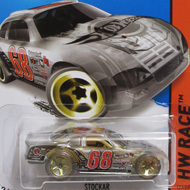 148/250 is part of the HW Race series and the 2014 Treasure Hunt set. 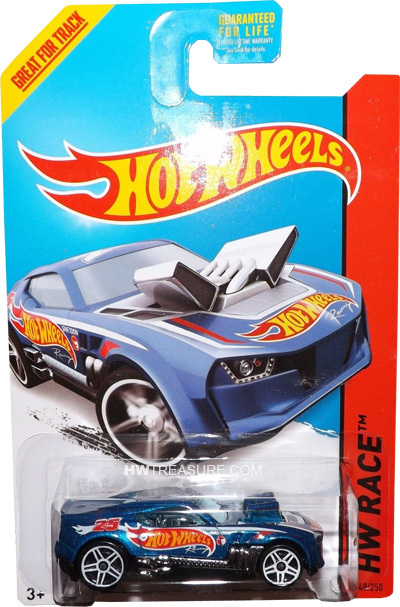 The metalflake blue car features red, white & grey graphics and “Hot Wheels Racing” on the sides and hood. The sides also have “25” and the low production symbol. 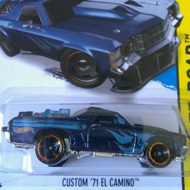 It has blue tinted windows, a chrome interior, PR5 wheels with white rims, and a black plastic Malaysia base. The Twinduction premiered in the 2011 New Models series. It is based upon a BMW X6 modified with an engine with huge manifolds sticking out of the hood.